American fashion model, Cameron Russell, has graced editorials for the past decade. At 16 she was scouted in New York and some career highlights include sashaying down the runway for fashion power houses like Versace and Chanel. And although she says that she loves her job, you should know that she’s not JUST a pretty face that wears lingerie for Victoria Secret. She’s got brains too. She graduated from Columbia University with a bachelor’s degree in economics and political science and is definitely not letting those smarts go to waste. In October of last year she hosted a Ted Talk, Cameron Russell: Looks aren't everything. Believe me, I'm a model. In this presentation she delved into how she got her start in modeling and what societal norms led to her winning “the genetic lottery” that enabled her successful career. The talk is less than ten minutes long but packs a punch of candid insider information about the modeling world and the power of superficial looks in our society. After that video went viral, she used her celebrity to found Interrupt Mag - a participatory Web magazine (that started off as an Anroid app) that allows women who feel marginalized by mainstream media to speak out - in March 2013. In its first printed issue, the subject of body image was introduced with notes and drawings from children. The writer of that story highlighted what those girls thought their bodies could do, in an effort to switch gears from body hating over cellulite and bushy brows to appreciating all of our bodies’ capabilities. Here are a few examples of those girls’ notes and drawings. 5-year-old Sofia (a.k.a. Lola) says, "I like my body because it's magic." Jeniah, who is 8 years old says, "I like my body. I like my eyes because they help me see different things. I also like my hands because they help me write different things. I also like my feet because they help me walk and have fun. My name is Jeniah and I’m 8 years old!" 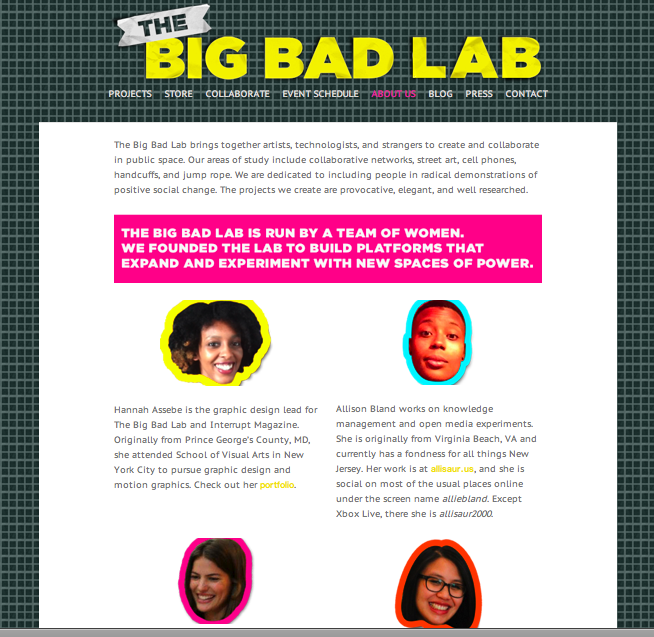 In addition to that, she also co-founded The Big Bad Lab, which is a collaborative Website that allows artists, writers, techies and other creatives to network and create outside of the mainstream media. She holds the position as director and writes about political power and grassroots public art while also experimenting with street art and art for the Internet. You can check out the site here. To read a bit more on this beauty-meets-brains woman, here's an interview that I found particularly interesting on thegreatdiscontent.com. This month you can also find her at Elle Magazine as the Elle.com blogger-in-residence.